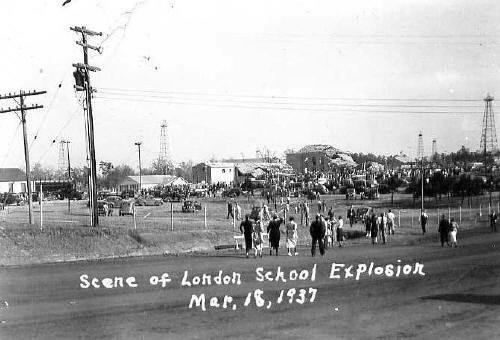 Dr. Bobby H. Johnson, my long-time colleague at Stephen F. Austin State University, has written a play based on the New London School Explosion which occurred on March 18, 1937. The play premiered at the Lamp-Lite Theatre in Nacogdoches in the Spring of 2005, and each performance drew a capacity crowd to the theatre. Someone from New London, including some now quite mature survivors of the explosion, attended every performance. The residents of New London, located in northeast Rusk County, had monies to erect a new school building because of the boom economy produced by the EasTex oil field. To save money, however, they ceased obtaining natural gas to heat the building from United Gas Company and connected directly to a line transmitting "green" gas from the field. The gas, which was odorless, leaked from a faulty connection and collected beneath the schoolhouse. As school ended for the day on March 18, about 500 students and teachers remained in the building, and a PTA meeting was in progress in the gymnasium. At 3:05, shop teacher Lemmie Butler turned on an electric sanding machine, sparking an explosion of the natural gas. The blast lifted the building, which then settled into rubble. Rescuers responded immediately, and kept coming from as far away as Dallas. Mother Francis Hospital, a new medical facility in Tyler, had scheduled ribbon cutting ceremonies that day but cancelled the celebration and devoted their efforts instead to caring for injured students and teachers. Governor James Allred sent public safety officials to help, and twenty-five members of the Texas Funeral Directors Association arrived to provide their professional service. Searchers continued to look for victims by floodlight all night. The explosion cost the lives of 298 students and teachers and altered the lives of everyone in New London; indeed, in all of Texas, because after the tragedy the Texas legislature required natural gas companies to add an odor to their product so that leaks could be detected more easily. Bobby's play left audiences quiet, many in tears. It would have been even more poignant if all had known how much of the play was autobiographical. Bobby, only two years old in 1937, had not yet started to school in New London, where the family lived. His father was one of the men who looked all night for other men's sons and daughters.